Almost everyone loves fresh fried foods because of their crunchy and crispy taste. However, frying foods has to be done properly in order to avoid a greasy result. The proper process involves with the right temperature and the right timing. You have to heat oil to temperatures between 350 °F (177 °C) and 375 °F (191 °C). Then, you have to submerge the food in hot oil and control the temperature throughout the process. This will help the moisture in the food to repel the oil. Also, the food cannot be cooked too long; otherwise, it will become too oily because much of the water in your food will be lost and the oil will begin to penetrate the food. Consuming too much oil is the main factor that negatively impacts your health. So, how bad is the oil in fried foods? 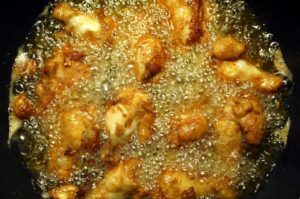 Because fried foods are completely submerged in hot oil, they can contain high levels of saturated fats which are solid at room temperature. These fats increase cholesterol level in your blood. High levels of LDL cholesterol in your blood increase your risk of heart disease and stroke. Fried foods can contain a lot of oil if you do not cook them properly. Oils lead to high calories which in turn cause obesity. When you use a deep fryer at home, you need to use at least 1-4 quarts of oil while you need only a tablespoon or less when cooking with an air fryer. What should you do to reduce oils in your fried foods? In addition to control the right temperature and cooking time, you can choose to use an air fryer to cook your foods. Air fryers use very hot air to cook the foods instead of using hot oil. The appliance will generate a very hot air from the top and then force the air to flow around your foods in all directions. Air fryers’ manufactures claim that the appliances can reduce oils supposed to get when using a deep fryer by 75%-80%. However, many people question whether it is worth to buy an air fryer because it is usually more expensive than a deep fryer. This oil-less appliance has additional advantages other than reducing risks of high cholesterol, heart diseases and obesity. When comparing between an air fryer and a deep fryer, the air fryer is easier to clean and use, more versatile and less smelly. There are many air fryers with different price ranges available in the market. Find a good air fryer review and select the one that is suitable for you. Next story How to reduce oils from your deep fried foods?